Arnold Moss was often called on to play shifty foreigners. He appeared in two films with Bob Hope and made hundreds of appearances in various old time radio broadcasts, TV, and film. 10/03/1974 0156 The Golden Blood of the Sun After migrating to Florida, a timeshare salesman runs into a series of mishaps. Believing him to be cursed, his boss sends him to Mexico City where he subsequently discovers that he is the incarnation of an ancient Aztec prince. 11/16/1982 1393 The Magic Dust A metallurgist stumbles upon a mysterious powder that inherently changes the structure of metal. His research leads him to his old college professor who warns him of the terrible secret shrouding the ancient dust. Despite severe warnings, industrialists seek to capitalize on the dangerous formula. 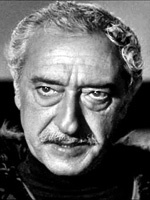 Mr. Arnold also played Kodos The Executioner, in an episode of Star Trek in 1968. MOSS'S RENDITION OF RODERICK USHER IS, IN MY OPINION, THE MOST MEMORABLE CHARACTER PERFORMANCE IN THE ENTIRE CBSRMT SERIES. When discussing the RMT and its actors, we might be hard-pressed to find a more classically trained, shakespeareian actor than Dr. Arnold Moss. Yet, unintentionally, he could do a "DOH" on par with the character of Homer Simpson who wouldn't be on the scene until a decade later. He did several of them in this episode, written by Dr. Moss in an adaptation of the Ambrose Bierce story which may have inspired the "Jonny Quest" creators 11 years earlier. The RMT couldn't directly "rip off" the very same sound in the "Quest" episode, but if their creature wasn't inspired by the TV cartoon version than the choice of sound effects (save the "pack of dogs" in the last attack scene) were quite a coincidence. just finished watching the black book with Robert Cummings (1948). Arnold plays a very bad guy very well during the french revolution. A politician who plays both sides but is never in the middle. I recognized his voice not his face. His talent spans decades. Thank you Dr. Moss. Moss could play a bartender as well as a rich captain of industry or sophisticated professor or person of royalty...top notch voice artist. I just had an occurrence of "why does that voice sound so familiar" while watching Star Trek episode "The Conscience of the King." Lead character played by Arnold Moss. Is he the only CBSRMT alumnus to have appeared on the original Star Trek? I listened to the show on weekends (not on school nights!) and over the summer in the '70's. I seemed like Moss was on an episode at least once a month! Fond memories!